The main threats to local air quality across the United States (as well as most everywhere else) remain smog and particulate pollution, which combined or acting alone trigger millions of hospital visits and health complications for citizens every year. The American Lung Association (ALA) reports that almost half of all Americans live in counties where air pollution routinely reaches unhealthy levels and can therefore make people sick or exacerbate pre-existing health conditions. The U.S. Environmental Protection Agency (EPA) points to mobile sources (trains, planes and automobiles) as the greatest contributor to American air pollution, but industrial sources such as power plants and factories are not far behind. Regardless of which kind of pipe pollution comes out of, the end result is consistently bad air quality in the nation’s 22 largest metropolitan areas and beyond. Breathing in smog, while inevitable in certain urban and industrial areas, can irritate the cardiovascular system and cause other health problems. As for particulate pollution, it too comes from a wide range of both mobile and stationary sources. 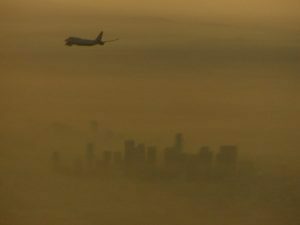 Chronic exposure to particulate pollution has been linked not only to cardiovascular issues but also to cancers and reproductive problems—and has been shown to contribute to premature death. Fortunately, the Clean Air Act has gone a long way toward cleaning up the air we breathe across the U.S., reducing key air pollutants overall by a whopping 68 percent since it first became law in 1970. A recent study by EPA researchers showed that, in 2010 alone, the Clean Air Act prevented more than 160,000 premature deaths, 130,000 cases of heart disease and 1.7 million asthma attacks, not to mention 86,000 hospital admissions and millions of respiratory illnesses. But even though four decades of Clean Air Act programs have already done a lot to improve our health, environment leaders and public health advocates alike would like to see lawmakers put in place even more stringent rules to reduce pollution of all kinds and put our economy on a cleaner, greener path overall. It’s great to see a blog post on air pollution. Air pollution is not a topic that anyone could be “on the fence” about, unlike climate change. With either topic, the goals are the same – reduce and eventually eliminate the burning of fossil fuels. I see much cleaner air in our future.